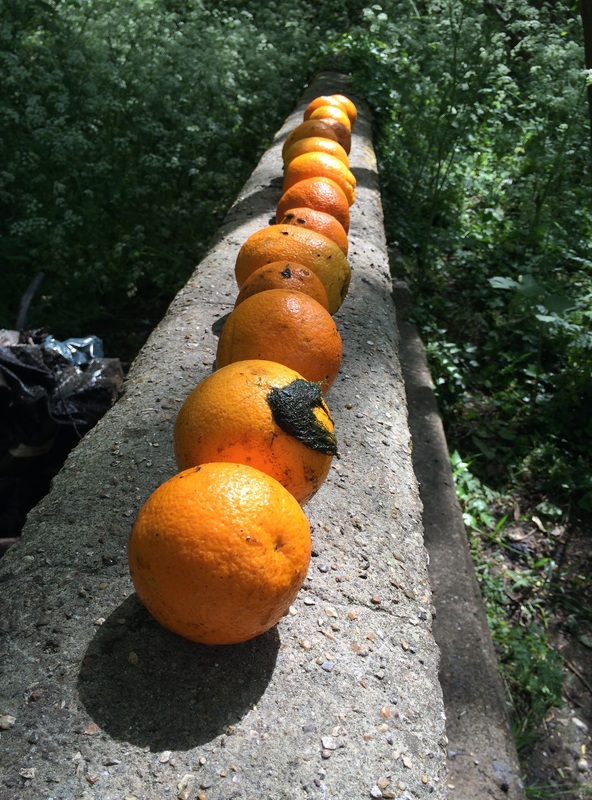 The sun was shining in all its glory for our May cleanup at North Road in Wimbledon. 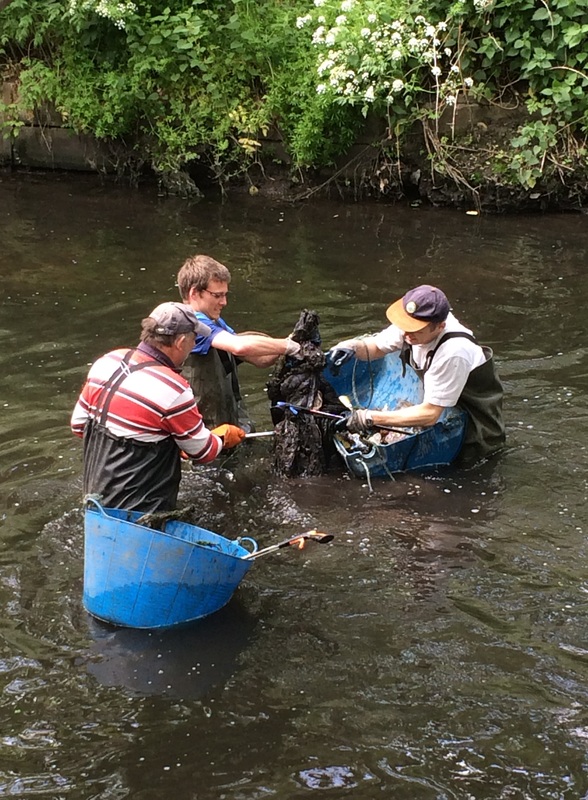 We had 38 volunteers join us for this month’s cleanup which was supported by the Living Wandle Landscape Partnership funded by the National Lottery’s Heritage Lottery Fund. 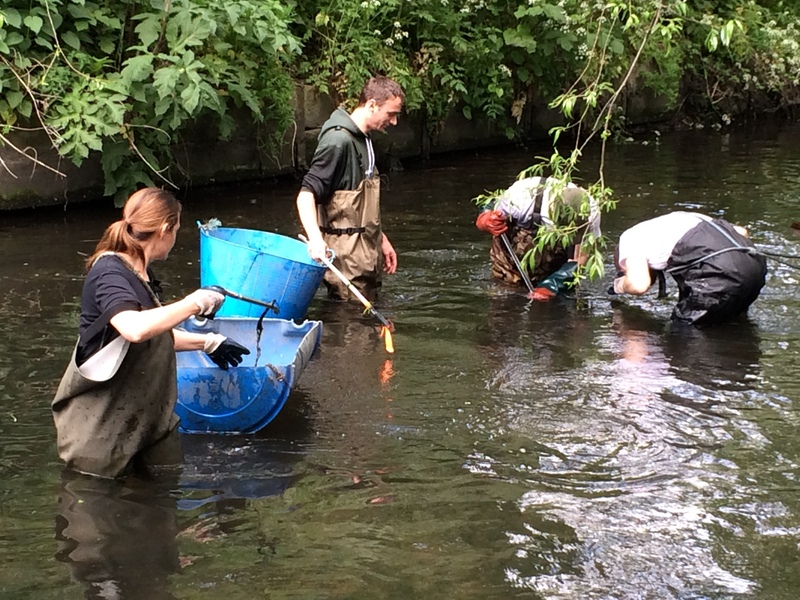 I started the cleanup with a quick talk on misconnections on the River Wandle. Most houses are served by two separate sewage systems, one for rainwater and one for waste water which is sent to the sewage treatment works. A misconnection is where an appliance such as the washing machine has been connected to the wrong sewage system, meaning untreated waste water is being discharged into the river instead of going to the sewage treatment works. 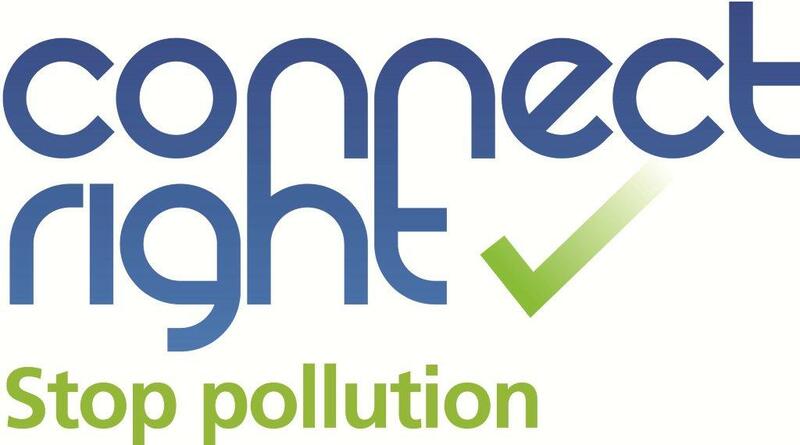 It is estimated that 300, 000 properties are currently misconnected in the Thames Catchment – a lot of unwanted pollution entering our rivers. 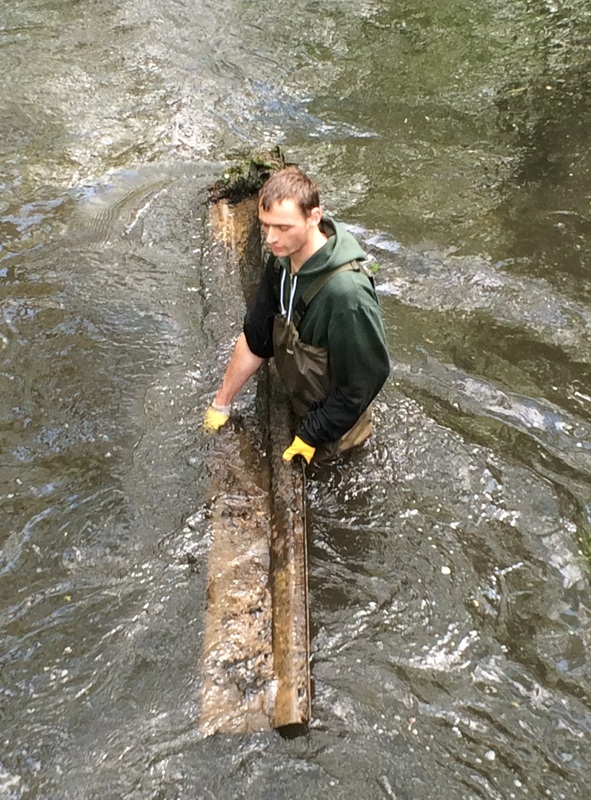 In the summer there tends to be less rainfall meaning that misconnections are easier to spot in the river. We have volunteers hunting these down for us. To find out more about misconnections and to check your property, visit the Connect Right website. The cleanup got underway after this, dividing into our usual teams with waders and their bank support, and litter pickers. 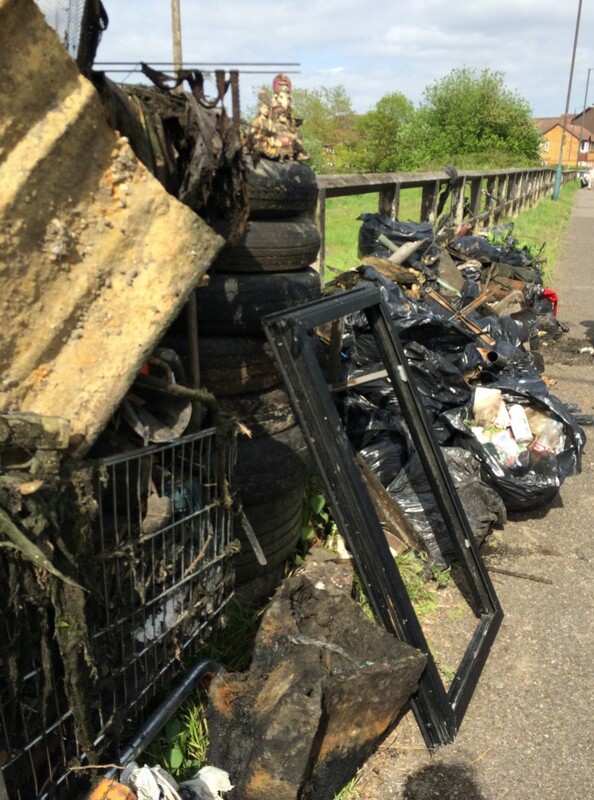 Knowing there were lower rubbish levels (thanks to some of our recent cleanups in this area!) our wading team took a long walk down the bank before getting into the river. 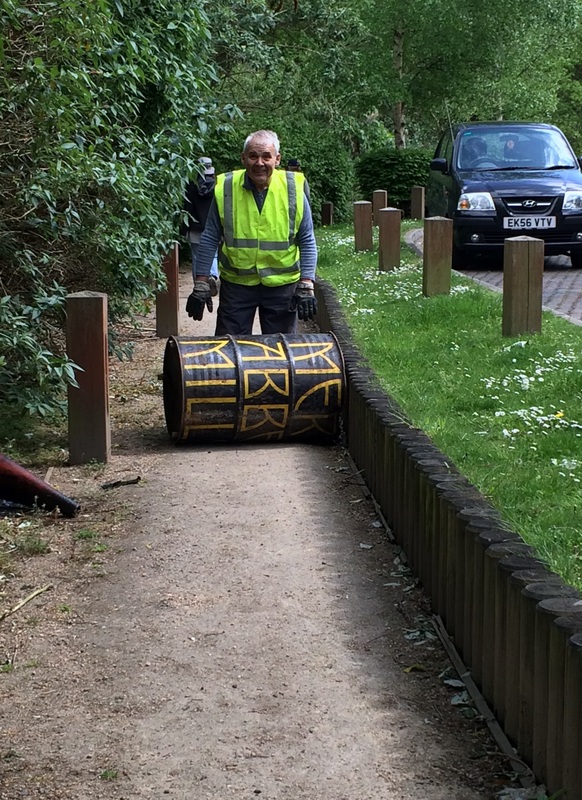 Meanwhile our litter pickers dispersed across Wandle Meadow Park and the nearby areas. 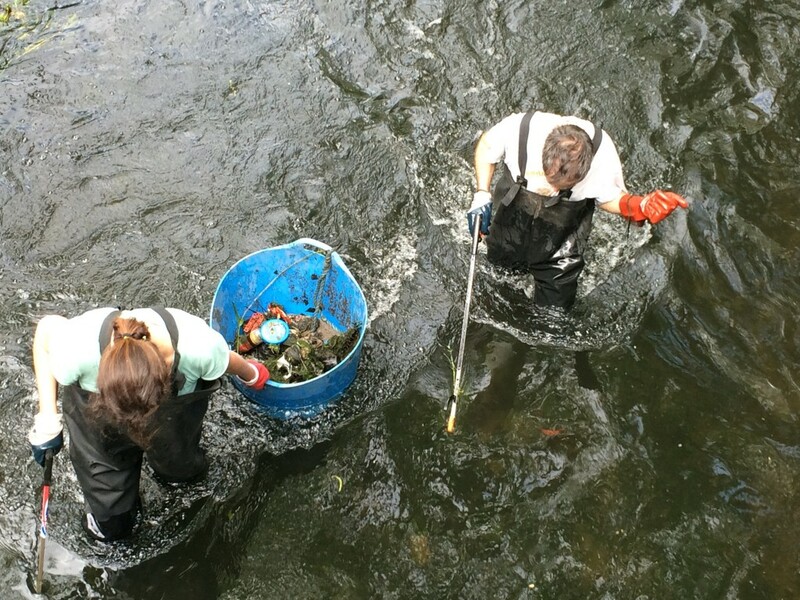 We immediately started finding all sorts in the rivers: tyres, traffic cones, beer cans and bottles. We even found an orange which we all found rather amusing. However, only half an hour later our orange count had gone up to 17 – something we didn’t see coming! 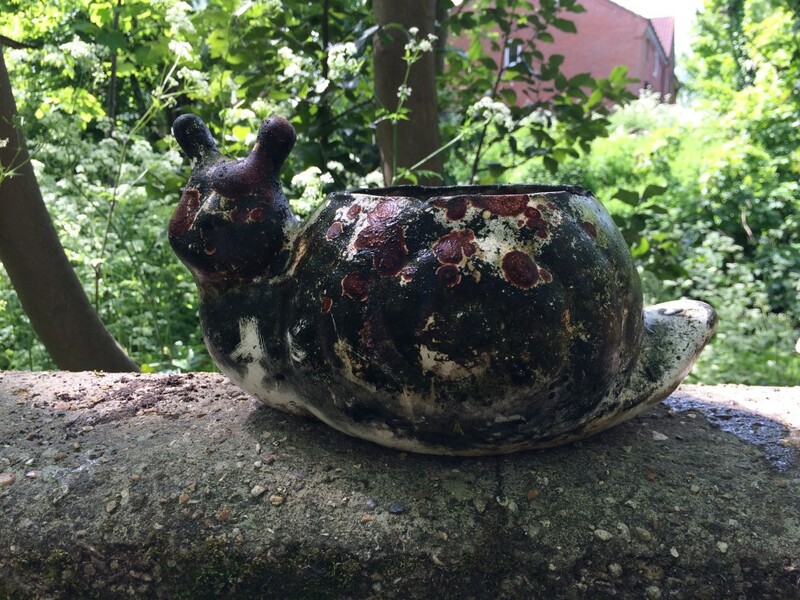 It wasn’t long until I received my first present from our waders in the form of a toy car and what we believe to be a snail flower pot. Our litter pickers were also incredibly busy having discovered the aftermath of a confetti cannon – hundreds of gold bits of foil scattered in the park. A painfully slow job but they managed to pick it all up! By lunchtime we were all very hot and welcomed a glass of squash and a piece of cake, kindly baked for us by Sally and Ann. After lunch everyone got back to work and we moved even further up the river, under North Road bridge. 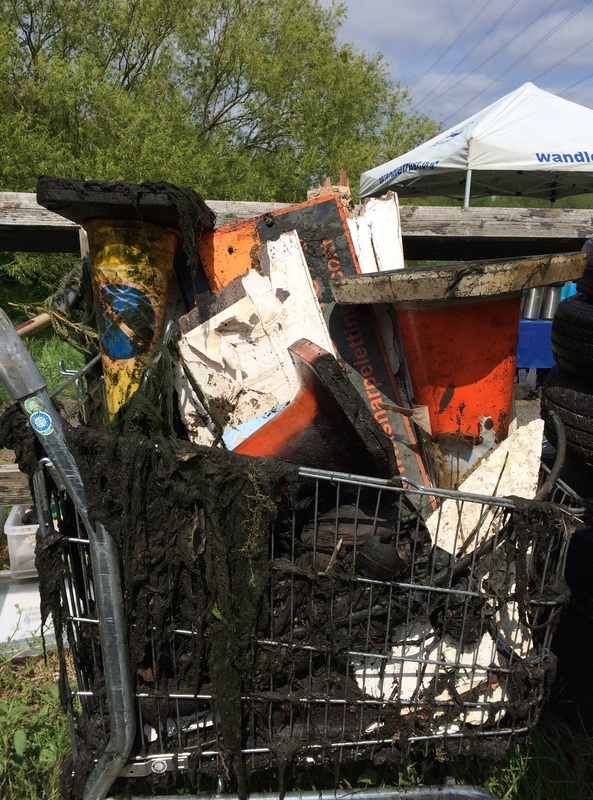 Here a trolley was discovered – a classic Wandle find. We also found an oil drum.. 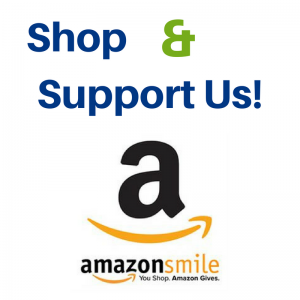 So a BIG thank you to all our volunteers who came and we look forward to seeing you at the next one on June 14th! So what did we find? 1 mattress, 1 toy soldier, 1 snail flowerpot, 1 toy car, 1 shopping basket, 1 bike, 1 iron, 1 carpet, 1 for sale sign, 1 bra, 1 quilt, 1 basketball hoop, 1 hoover head, 1 trolley, 5 traffic cones, 11 tyres, 20 oranges and 35 bags of other rubbish! Huge thanks to everyone who helped pack up van after the event, Sally and Ann for catering for our volunteers, Wally and Lawrence for helping supervise everyone on the day and the Waste Management Team at Merton Council for organising collection of all the rubbish the next day. Thank you to all our volunteers for coming: Aaron G, Aaron P, Ann, Bella, Charles Chris, Daniel, Dave, David H, Dennis, Derek, Felix, Gary, Ged, Gemma, Ian, Joe, John, Julia, Keith, Ken, Lawrence, Luke, Margie, Matylda, Oliver, Patrick, Penny, Per, Peter, Richard, Rob, Rose, Sally, Stella, Stewart, Theo and Wally. So what did I learn from this month’s cleanup? That it is easy to get sunburnt when supervising from the bridge! 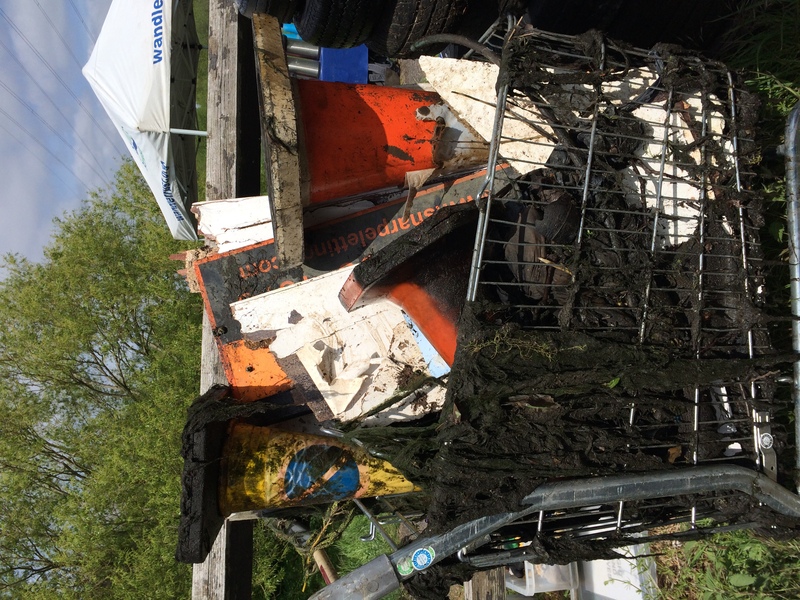 This entry was posted in Uncategorized and tagged Cleanups, Events, Living Wandle Landscape Partnership, People, Pollution monitoring, South East Rivers Trust, Spreading the Wandle Word, Volunteer, Wandle on May 14, 2015 by Polly.